Holiday.gr - Perithia, a trip to a myth! Perithia is a region of unique beauty. It combines natural beauties with the architectonic richness of old times. The desolation of the area, the remains of old mansions and the picture of dereliction, fill the visitor with mixed feelings. 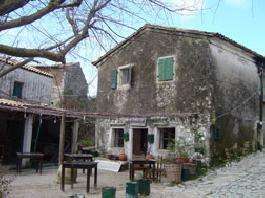 The village of Perithia is in north Corfu, 8km from Kassiopi and in the middle of mountain Pantokratoras. It was built in replacement of the old village named Old Perithia, which although it is abandoned, has big interest for the lovers of walking in nature and for those admiring old buildings. Old Perithia is like a ghost village. It just doesn’t cause fear, but admiration, curiosity and a mysterious charm that makes every walker wanting to sit and admire the green nature. The whole village is a unique architectonic monument. A long time ago its residents started to abandon it seeking for better living conditions, until we reached that picture of abandonment. The stone houses, built from the local stone stand against the pressure of time-still- imposing but tired from the unequal battle. During the last years, the municipality of Thinalia where the village belongs to, has started a restoration program for the mansions of Old Perithia trying to save a part of the island’s history and to give those buildings back their old glamour. Apart from the residences, highly impressive are the village’s churches, circular around the village that reveal the deep creed of residents. In the entrance of the village you will see the bell tower of Saint Iakovos Persis, a remarkable religious monument. Another building that will attract your attention is the school, an impressive baronial house with the blazon of the local archon Skordili in its entrance. This school functioned until 1940. The village of Old Perithia has about 130 houses built according to the venetian architecture. Today in some of them live occasionally shepherds. The newer village of Perithia has no tourist growth. But when touring around the corfiat countryside it is worth visiting and taste recipes from the local cuisine in the graphic taverns of the region. Been to Perithia ? Share your experiences!